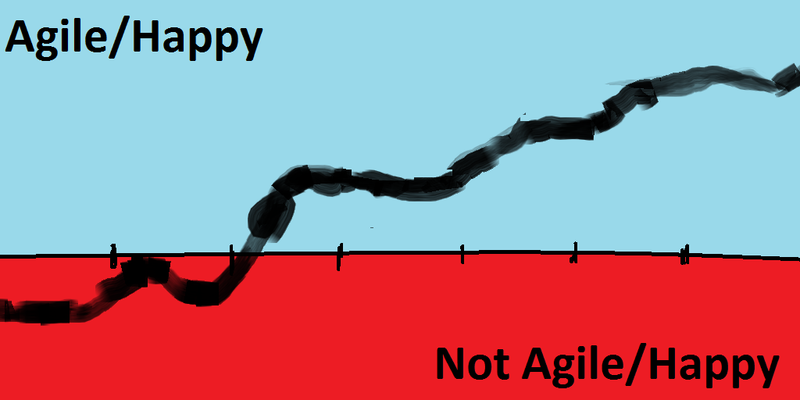 I call it the "Agile-o-meter". It shows that the transition to being Agile is difficult and fraught with the possibility for things to go wrong. We certainly failed (fast/early?) on our first attempt. 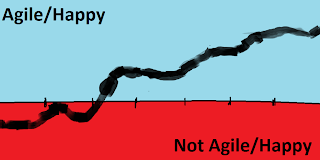 This chart is my interpretation of the emotional state of the Team as we moved toward being Agile. The two prominent local maxima in the chart (at approximately horizontal point 1 and point 2) show where we crashed an burned with our first attempt at Scrum, and then subsequently nailed it, with the help of a Scrum Coach. The peak of the second maxima is where we effectively reached the end of our budget for Scrum Coaching and went it alone - we learned a few lessons the hard way (for example that running a Retrospective is really really important!) before we started tracking up again. The reason I've made the chart a bit fuzzy is to emphasize the fact that this is pseudo-science - it's my interpretation of how the Team felt a certain stages in our implementation. The Scrum practitioner who recommended that I use this chart to "guide" my talk said that he knows a ScrumMaster who does lierally track/measure his Team's happiness level Sprint-on-Sprint; he takes a measure from each Team member from 1-to-10 and uses the output as a tool to see whether things are going OK, or not, then tease out discussion on what's upsetting people, etc. Great idea, I think we'll give it a go.